Many years ago Carroll Shelby partnered with Hertz Rent-A-Car to provide Shelby Mustangs for the rental market. The cars were returned to Shelby and he sold them to the public for cheap because nobody wanted an ex-rental car. Today, the Hertz GT350H is a high dollar collectible sought after by Shelby fans and command six figure prices from sites like Hemmings.com...but luckily for cheapskates like you and me, there is a cheaper way to get into a Herztang. 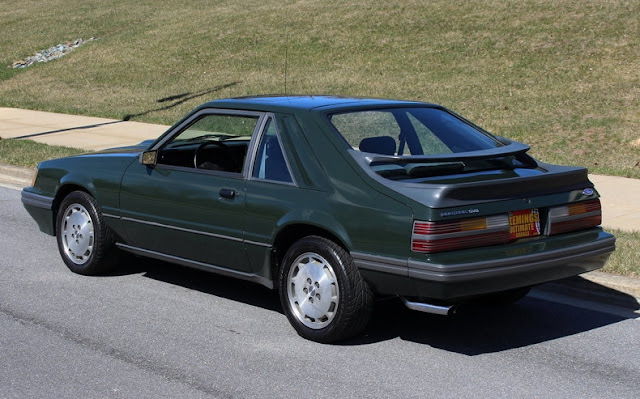 Find this 1985 Ford Mustang SVO here on eBay offered for $24,990 or best offer, located in Rockville, MD. Tip from Zach Z. 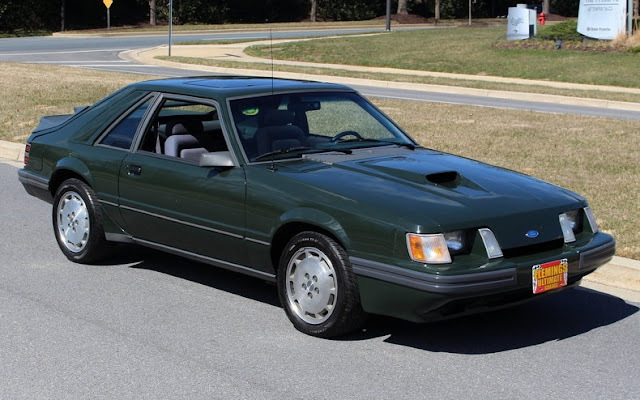 1985 MUSTANG HERTZ RENT-A-Racer â€¢ 1 of 60 Mustang SVO's Purchased by Hertz â€¢ 1 of only 10 Dark Sage Green Mustang Produced in '85 â€¢ 1 of only 4 Dark Sage Rent-A-Racer's still in existence â€¢ Unbelievable, all original, time capsule and only 67,648 original miles (driven 2000 miles a year!!) â€¢ Ford EFI 2.3Liter Turbocharged 4-cyl @ 175HP â€¢ Original 5-speed, close-ratio, manual transmission â€¢ Original HD, Traction-LOK Rear differential â€¢ Mirror factory "4E" Dark Sage Green paint professionally show waxed & detailed â€¢ Functional Hood Scoop for Air-to-Air Intercooler â€¢ Great looking Graphite Grey bucket seat interior with full factory console and shifter â€¢ Full factory gauges including 8K RPM Tach â€¢ Factory wrap steering wheel w/ tilt column â€¢ Ice-cold factory Air-Conditioning A/C â€¢ Original AM/FM/Cassette Stereo from Dolby system â€¢ Loaded w/ options including power windows, power locks, power mirrors, & leather trimmed Hurst shifter â€¢ Rack + Pinion Power Steering & Power Disc Brakes â€¢ Original 16" wheels w/ High-Speed Radials â€¢ Loaded with docs including Elite Marti Report and copy of the Original Window Sticker too! â€¢ Show or drive this ultra-Rare Hertz Rent-A-Racer All wholesale priced vehicles, like this one, do not qualify for our free extended warranty but can still be purchased at our wholesale cost. I've always loved the SVO. I almost bought one but sadly couldn't come up with the cash back then(about 8k if I recall correctly). It had the back wing sag pretty bad too.